When you’re faced with the challenge of limited space for a new conveyor line, vertical transfer units (VTUs) can save the day. The most common way traditional conveyor manufacturers save space with a vertical transport unit is by creating a return path under (or over) the main line. But there are lots of ways to utilize VTUs in a line to reduce conveyor system floor space. A Vertical Transfer Unit (VTU) is sometimes called at Vertical Transfer Unit, an elevator, a lowerator, a lift, or a Vertical Reciprocating Conveyor. They are all the same thing. We call ours a Vertical Transfer Unit (VTU). In our case, the VTU is electric motor driven with a step-servo or pure servo and is programmed with acceleration/deceleration curves to stop precisely at an unlimited amount of positions between the upper and lower physical limits of the unit. The result: smooth motion control and positioning, greater speeds and ultimate flexibility. We’ve used pallet elevators (VTUs), sometimes multiple per line, to vertically transport a conveyor section or pallet up just a small distance to a workstation just above the line (and a bypass underneath). With this design, a robot or employee can perform a parts operation directly on the elevated section. Stacking them vertically effectively doubles (or triples) the number of workstations available on a single line. Traditionally, the only other way to accomplish this would have been additional lines side by side. Instead, integrators can improve efficiency while saving space by creatively incorporating VTUs in the pallet automation system. Our competition will typically push you into one of two or three different size categories of conveyors and VTUs since they prefer not to accommodate customizations in size. We’ve built our entire manufacturing process around custom-built sizing, without charging more for it. It’s simply a different manufacturing philosophy, and one that differentiates us. A flexible conveyor manufacturer like Glide-Line can offer any size lift you need, rather than you adjusting or compromising your design to fit a standard size. Your clients’ manufacturing spaces aren’t standard – why should your design options be? These three ways of integrating vertical transfer units within a conveyor system save space, allowing for more work space. 1. Double the lifts, none of the added width. 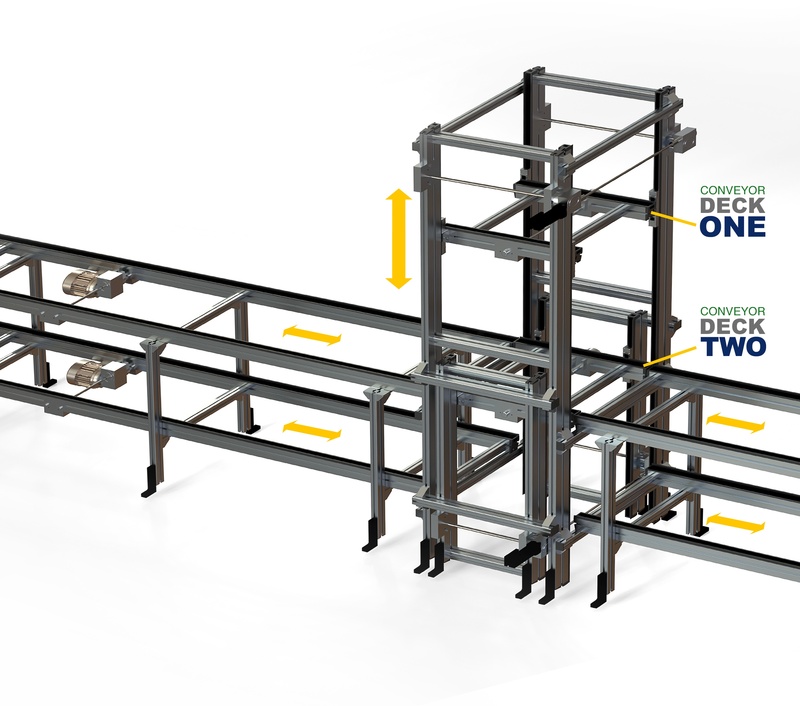 A dual deck elevator from Glide-Line uses two conveyor pallets within a single VTU footprint. This allow you to transport 2X the product at the same time, saving rate and increasing efficiency. It is built identical to our standard VTU, but with two decks instead of one. Dual deck VTUs are used for optical inspection, quality control, and more. While a specific pallet, tray, or product is elevated to head level for inspection using the first lift, good product can continue to move through underneath. This prevents production from slowing down in the inspection/QA phase. 2. Ingenious design enables even more efficiency. This application, called a dual axis lift, incorporates more than one within one elevator footprint. It handles infeed from or discharge to two or more locations simultaneously. This is especially useful for processes requiring fast-paced throughput; we’re able to increase the amount of product being shifted vertically by two, three, four or more times – as many elevators and additional lines as are needed to accomplish the increased speed. In fact, they don’t even need to operate simultaneously; each can be programmed to operate on its own axis as needed for your client’s process. They can actuate independently, delivering countless possibilities. For example, while one pallet lifts to a second conveyor above or to an accumulation zone, a second pallet can take its place and continue the automation process underneath, allowing product to pass directly through the lift shaft to the next workspace. 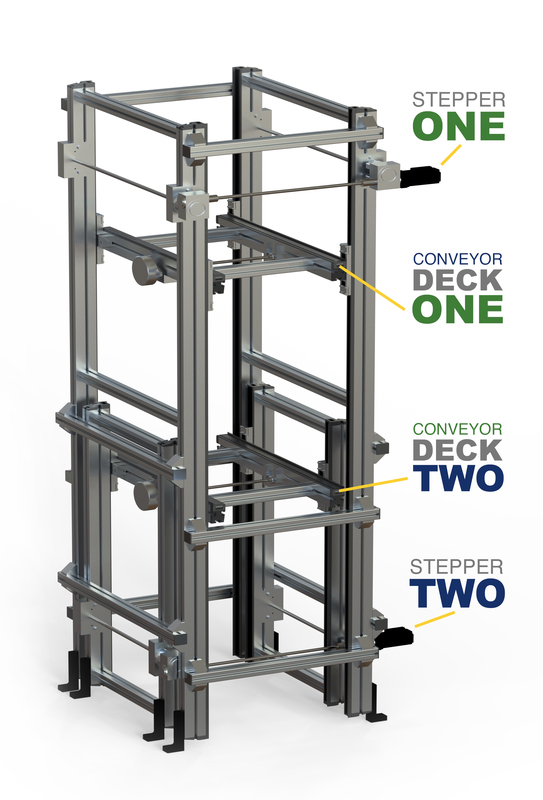 Multiple deck lifts are used in situations where time savings and efficiency are of the utmost importance. For example, a recent window manufacturing client used a multiple deck lift with two conveyors inside. One went to the left, and one went to the right. Both lifted at the same time to push the windows onto two separate racking systems ten feet in the air. 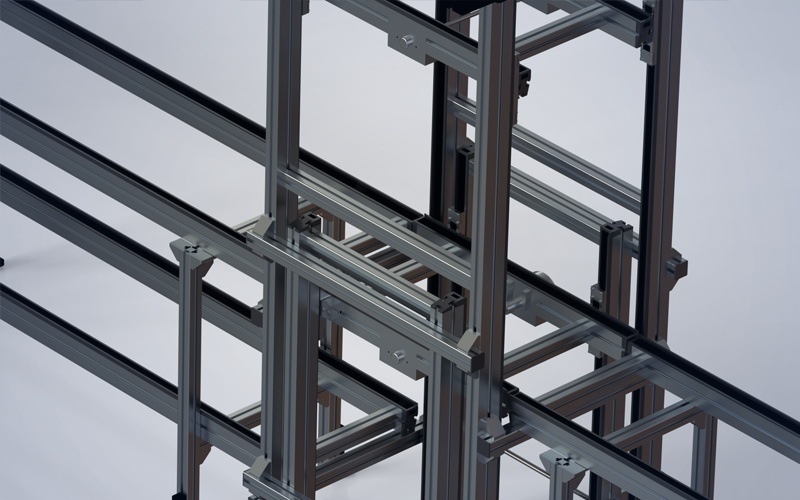 This exact solution could have been modified to add more lifts to support more products, whether products needed to be added to a racking system for curing, or screws needed to be installed to a mechanism. Shift operations vertically to accommodate additional workstations. Consider using a bypass lift to vertically shift process operations to a level above the main line. This innovative use of a VTU keeps the product flowing efficiently and doesn’t require additional width to be added to the automated conveyor system. A bypass lift is similar to a double elevator, with the main purpose being increased throughput and space savings. 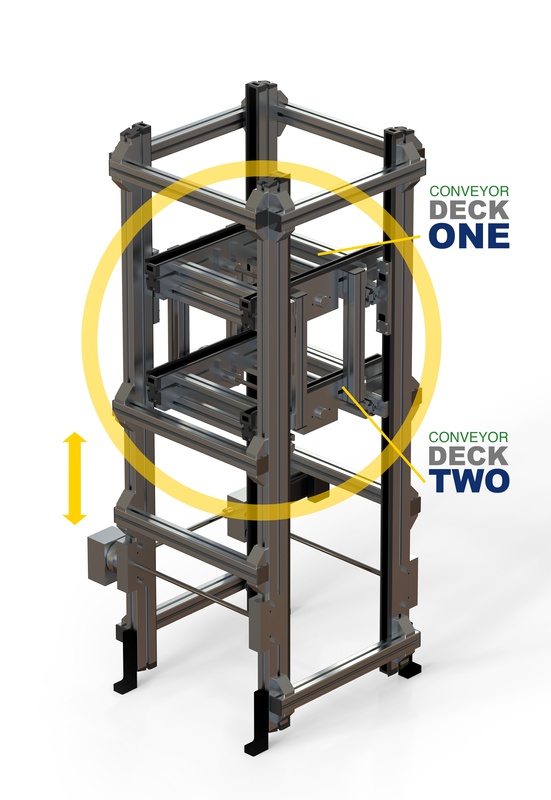 Traditionally, a parallel conveyor workstation is needed in a process automation system for an operation to be completed; instead, with a bypass lift, we typically see the use of multiple bypass lifts within one conveyor to perform the operation on multiple pallets throughout the conveyor. Integrating vertically stacked conveyors while using VTUs to do the heavy lifting (no pun intended) of moving operations where they can be performed most quickly is a new way to think about both VTUs and conveyor layouts. But the theory of growing up, not out, when it comes to conveyor automation systems has been tested and shown to be successful in many of our integrator clients’ manufacturing plants. Read a recent case study for more information.